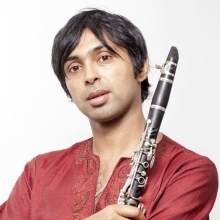 Arun Ghosh is a British-Asian clarinettist and composer. His second album, Primal Odyssey, was released in October 2011 on camoci records. In 2008 he was selected for Edition IV of the Jerwood/PRS Foundation 'Take Five' initiative for emerging jazz musicians produced by Serious. In 2009, he was invited to perform at the jazzahead! 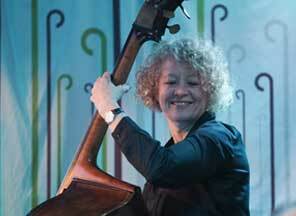 Festival in Bremen, Germany as part of the UK showcase presented by Jazz Services. In 2010, he was made an Associate Artist at The Albany Theatre, London - a position still held and in April 2011, Ghosh was made an Artist-in-Residence for the Southbankâ€™s Alchemy Festival. September 2011 saw Arun Ghosh feature as the cover star for Jazzwise magazine, the UK's biggest selling jazz magazine. Conceived in Calcutta, bred in Bolton, matured in Manchester and now living in London, Arun Ghosh's musical vision and vocabulary reflects his rich geographical heritage. His Indo-Jazz Sextet play original music of South Asian origin with a contemporary jazz attitude,rocking urban beats and the passion of punk. Sweet and timeless melodies give birth to soaring improvisations and raag explorations, driven by a heady mix of dub-reggae bass, tabla trickery and ferocious drum explosions. The first Arun Ghosh IndoJazz Sextet performance took place at the London Jazz Festival in 2007. The stellar line up consisted of: Arun Ghosh - clarinet, Idris Rahman - tenor saxophone Dr Das - bass Aref Durvesh - tabla and dholak Kishon Khan - piano Myke Wilson - drums This band rocked the Southbank - see footage http://www.youtube.com/camocivision - and has since lit up the British jazz scene with intense and cathartic performances at clubs, festivals and melas in London and around the country. Alternative line-ups include Liran Donin (double bass), Shabaka Hutchings (tenor saxophone), Nilesh Gulhane (tabla), Rastko Rasic (darbuka), Corey Mwamba (vibraphone) and Pat Illingworth (drums). Arun Ghosh released his debut album â€œNorthern Namasteâ€ on camoci records in 2008 to critical acclaim. The album has UK retail distribution through Harmonia Mundi and is available as a digital release on iTunes. The opening track on â€œNorthern Namasteâ€ entitled â€œAuroraâ€ also appears on Gilles Peterson's compilation album â€œBrownswood Bubblers Threeâ€. Following the success of his official â€œhomecoming' album launch at Contact Theatre, Arun performed to packed audiences and rave reviews at:- Brighton's Great Escape Festival, London's Vortex, the City of London Festival, Streatham Festival and to a sold-out crowd at London's Pizza Express Soho Jazz Club. Appearing at the Manchester Jazz Festival, Arun's IndoJazz Sextet was deemed â€œgig of the festivalâ€ by patrons of Matt&Phred's Jazz Club, and a streamlined Arun Ghosh Quartet fired up the Indo-Electronica tent as part of the year's London Mela. Two performances at the London Jazz Festival 2008, saw Arun Ghosh's bands playing to a sold-out audience at the Purcell Room, Southbank in a double-bill opposite Rudresh Mahanthappa Quartet plus a capacity crowd at Ray's Jazz Cafe at Foyles. 2009 was another exciting year for Arun Ghosh. Highlights included a high octane performance at the jazzahead festival, Bremen that took European jazz promoters by storm, a sold-out show at Ronnie Scott's Jazz Club in August, and his role as Musical Director and performer with Malian legends Amadou and Mariam at the Manchester International Festival. Ghoshâ€™s international appearances in 2009 saw him perform sell-out concerts at Franceâ€™s Jazz Sous Les Pommiers Festival and the inaugural Elbjazz Festival in Hamburg. 2010 saw Arun Ghosh continue to build upon his sonic explorations. First premiered as part of his Magical Musical Merry-Go-Round events at the Albany and at the London Jazz Festival 2009, new instrumental ingredients in the Arun Ghosh aural recipe included cello, bass clarinet and bass sitar (surbahar). Arun Ghosh is equally at home playing in an intimate trio as clarinet/bass/tabla or leading his 'Horn E Bass Quintet' with a frontline of clarinet, bass clarinet and sax sparring with a powerful bass and drums rhythm section. Primal Odyssey, Ghosh's 2nd album, is the sound of this Horn E Bass Quintet and represents a back-to-basics approach to recording - five musicians in a room playing together, a classic jazz set-up. Constantly experimenting with live formats and arrangements has been key to Arun Ghosh's growing reputation for creating music that is â€œ...at once no-nonsense, thrilling and beautiful...uproarious and irresistibleâ€ (The Telegraph). A charismatic live performer, Ghosh has regularly appeared at several major UK venues and festivals, 2011 will see his 5th consecutive appearance at the renowned London Jazz Festival. In addition, Ghosh's international presence has increased significantly with shows undertaken at festival and venues in Germany, Austria, India, Kuwait and the United Arab Emirates. Alongside his performance activity, Arun maintains a healthy composition and education workload, particularly in the world of theatre, in addition to collaborating with other musicians, writers, poets, filmmakers and dancers. 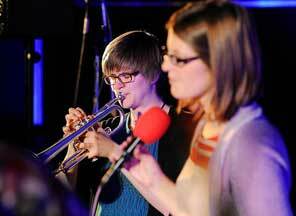 Find information about artists who have worked with EMJAZZ or appear on our current schedules. Find out about our many venues across the East Midlands and how to get there. Find out what's on, where and when in the East Midlands. 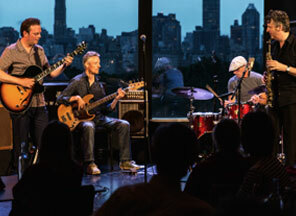 Sign up for our newsletter to receive the latest EMJAZZ news and events.